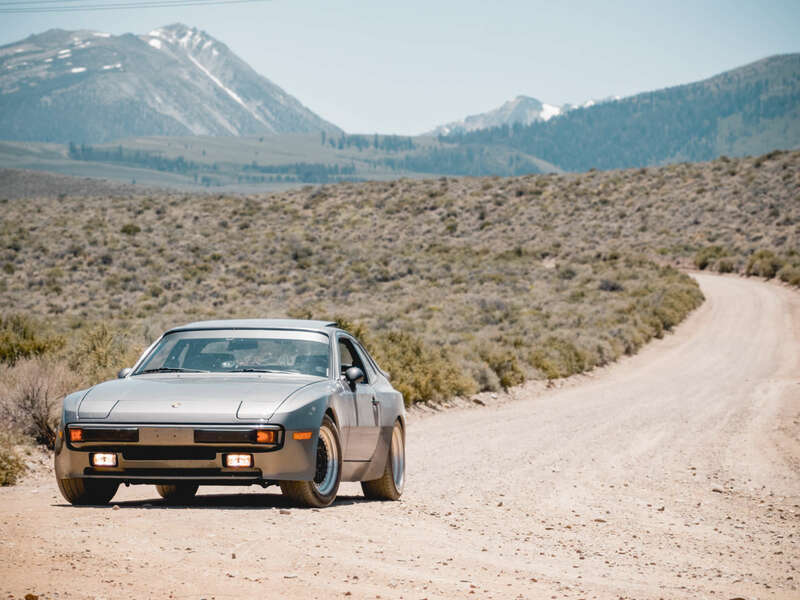 Just to clear things up straight away: the traditional methods of exploring the outdoors: hiking, biking, horseback… all are way more reasonable approaches than choosing a cramped, hot, not-particularly-reliable nor powerful vintage sports car. But over and over again, I do the unreasonable thing and take an old car to places it really, really doesn’t belong. 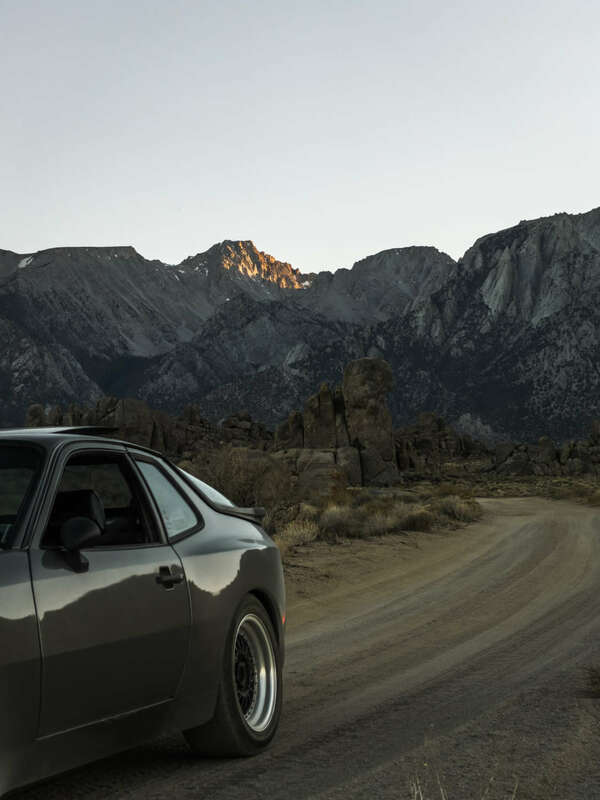 My name is Sean and I drive a 1984 Porsche 944. 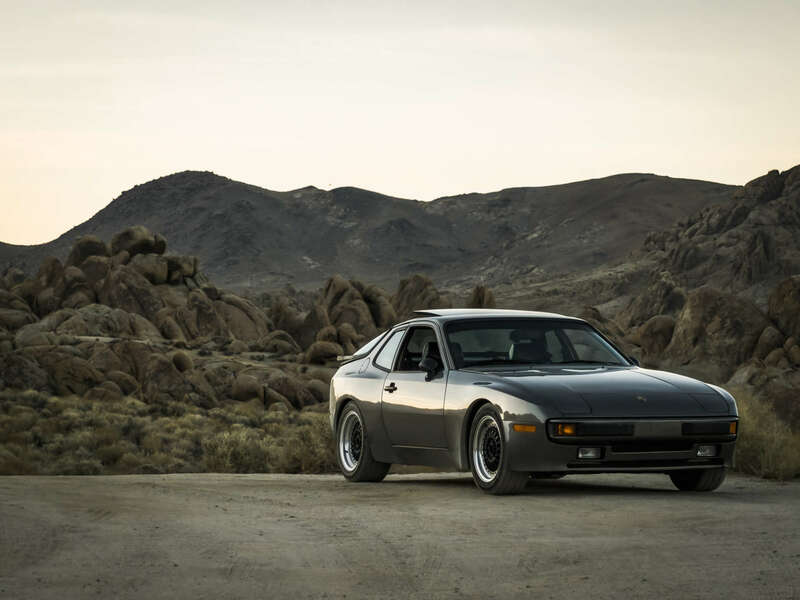 My name is Sean and I drive a 1984 Porsche 944. 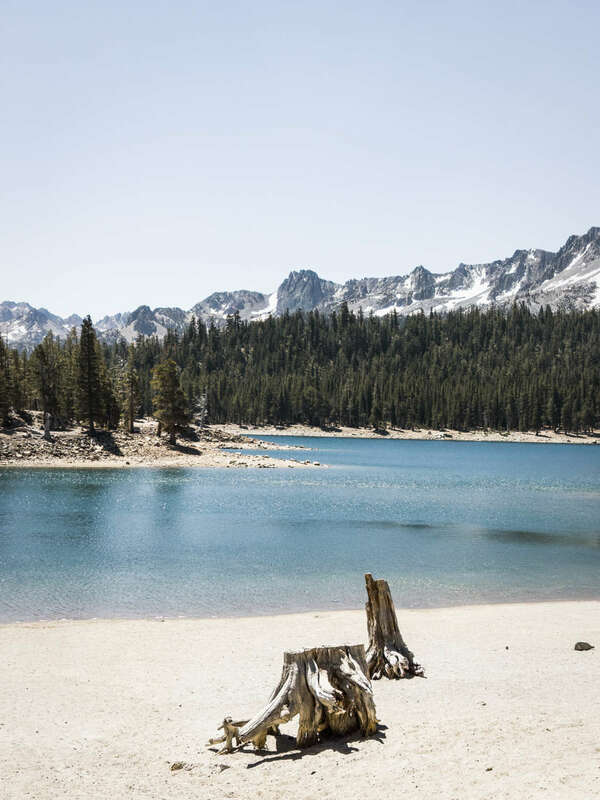 The Highway 395 Corridor of California on the eastern side of the Sierra Nevada Mountains. Drive it north to south and back, hunt every dirt road and mountain pass that looks good, while trying to tick off the list of favorite spots provided by friends, who take the aforementioned reasonable approach. 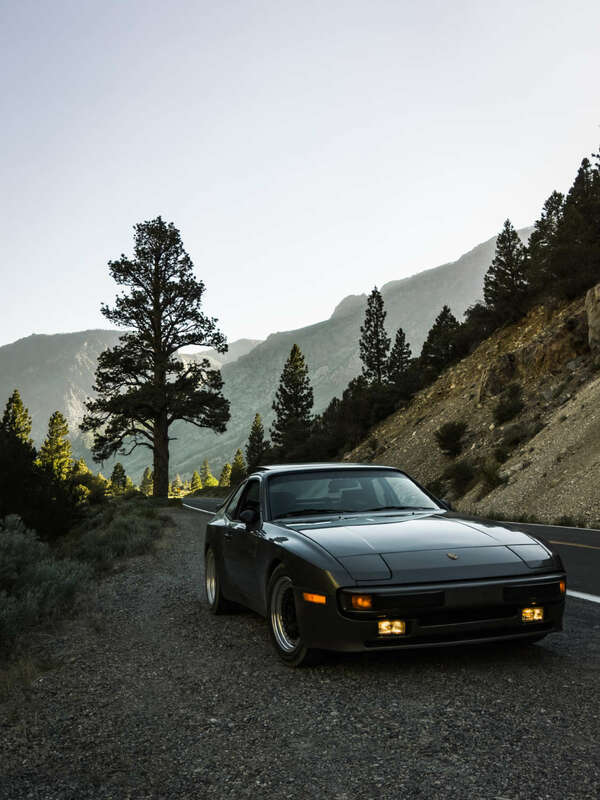 The Porsche 944 is an overlooked car in the vintage Porsche lineup. Light, with a water- cooled engine in the front and the transmission in the back, it has 50/50 weight distribution and excellent handling. With less than 150HP though, it is definitely a momentum car. I’ve made modifications to the suspension to get the most out of that momentum, shed some additional weight from the chassis, added harnesses and upgraded all the touch points such as seats, steering wheel and shifter for sportier alternatives better suited for heavy use. 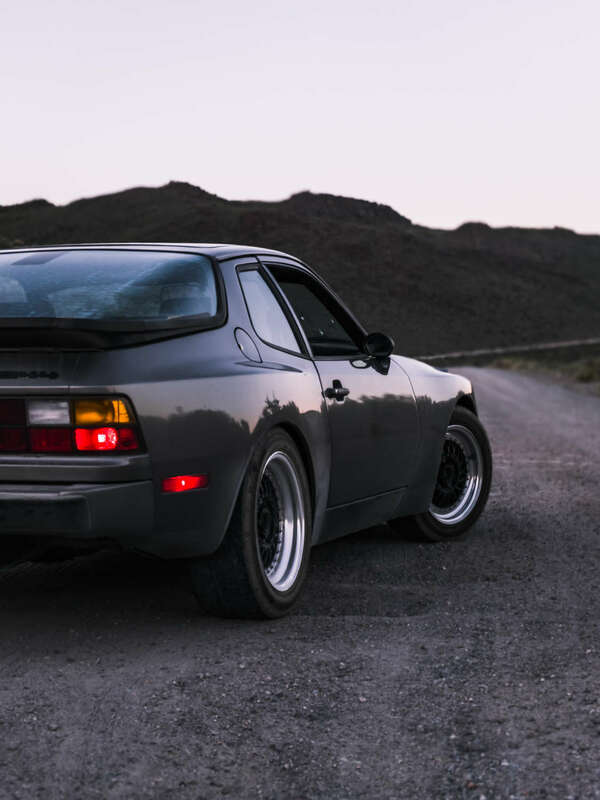 The Porsche 944 is an overlooked car in the vintage Porsche lineup. 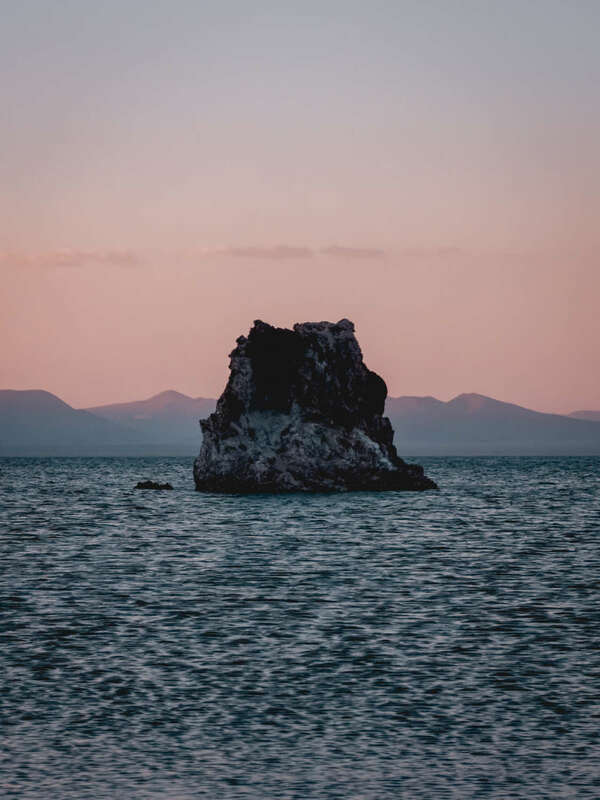 Setting out from Sacramento in late June, the car got packed with a full-size spare wheel, service ramps, complete set of tools, a heat-insulated five gallon gas can, three gallons of water, caché of cold brew coffee, enough clothes to get by with for a week and a camping set up. Camping being the backup plan in case I found myself using the tools, ramps, needed more than one spare wheel and no one found me doing it for a while. Also a towel. If you’ve ever read Douglas Adams, you bring a towel. 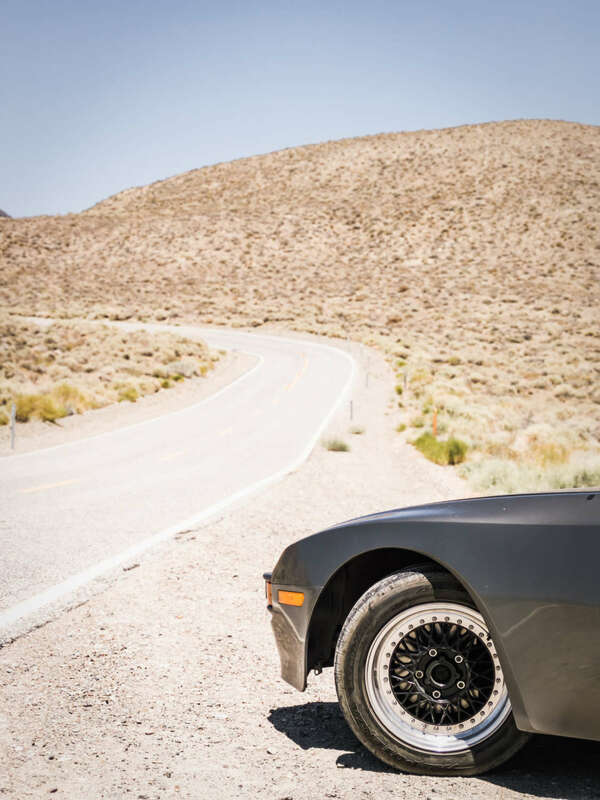 Surprisingly the car still felt pretty nimble with the weight of added cargo as I climbed from the valley to make the first pass from the north via Lake Tahoe to Monitor Pass. I made the early choice to keep the windows down and radio off in spite of the heat, but once cresting Eagle Summit in Tahoe there was a surprising view: absolutely blank, white nothing. A couple of fires to the west had combined and one going in the south had completely filled the basin with smoke in just a couple of hours. 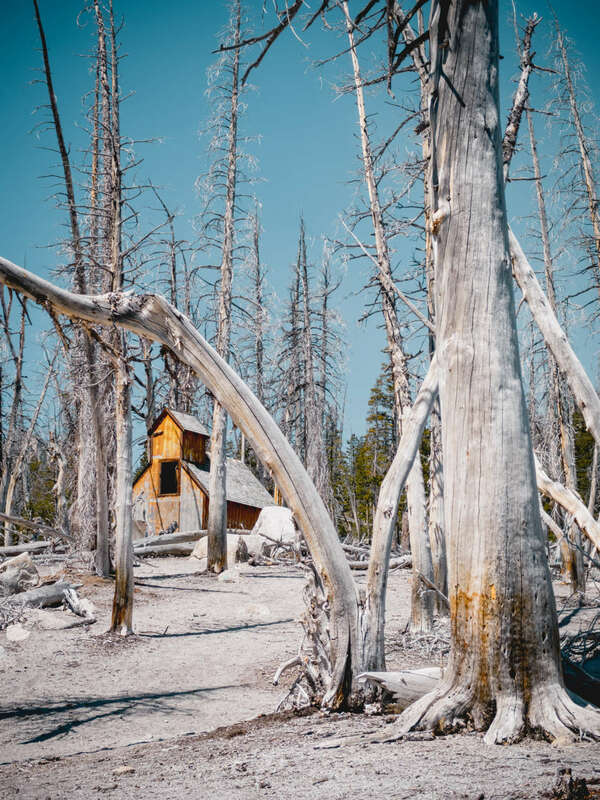 With temperatures right around 100 degrees Fahrenheit and thousands more feet to go in elevation, the windows stayed down and AC off to avoid overheating. Finally cruising on 395 South after the summit, a gas stop in Bridgeport set the tone: smoke and heat prevailed. At altitude you really feel the exposure to the sun. 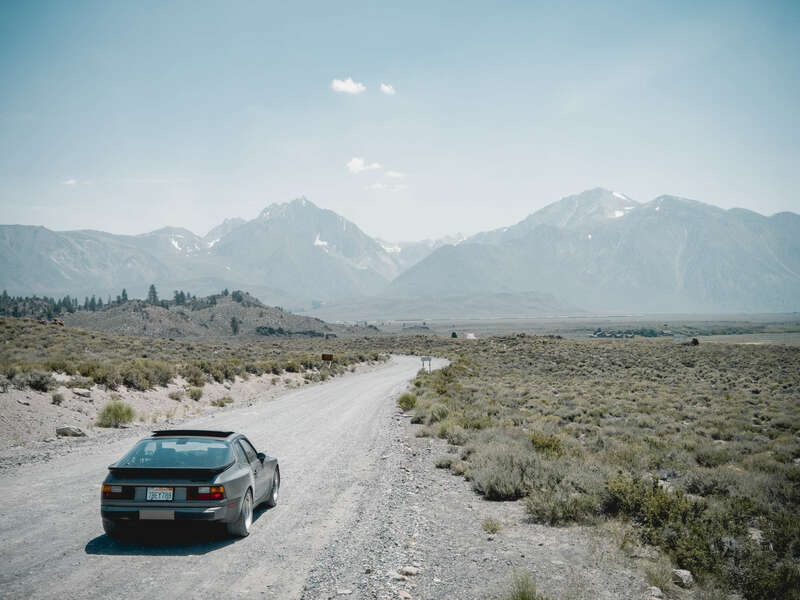 Continuing to the first stop in Mammoth I peeled off on a recommended dirt shortcut. The trail rigs coming down the other way should have been a sign, and the looks their driver’s gave should have been the flashing lights: No place for a Porsche, buddy. After a few punishing, washboarded, crab-walking miles I turned the car back, wishing I still had my Volvo 142 rally car. With that car poor roads, dirt and gravel smoothed out with more speed. 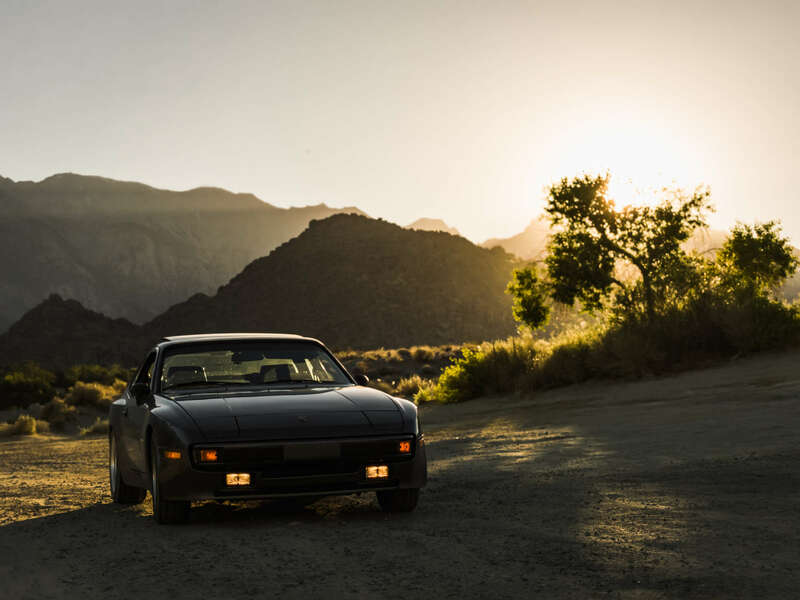 Not the case with the 944. This car would tripod on an acorn. It was no good in dirt. Dropping off some gear and grabbing a meal in Mammoth, the light started to get good as the sun headed for the horizon and with it a comfortable temperature arrived. For a photographer, the smoke lent an advantage. A surreal, saturated golden hour started early and lingered on for hours. 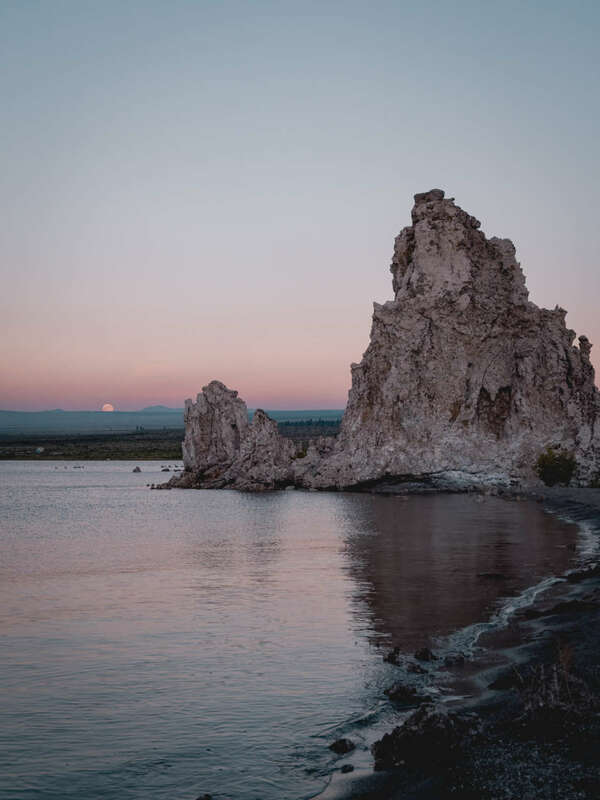 I hit the road back north to make sunset at Mono Lake. It didn’t take long to realize once there that 1) There are two South Trufa areas of Mono and unless you like to breathe bugs and not get pictures, I was at the wrong one, and 2) If I came back the next day there would be a full moon rising right at sunset. 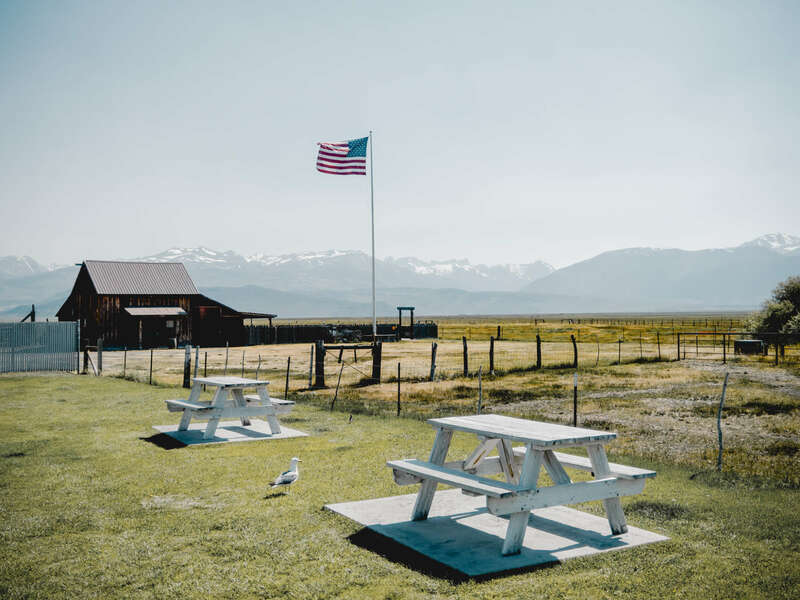 I called it a good scout, a family travelling in an RV from Germany freaked out about the car, I found a BBQ, a beer and an outside table in Lee Vining and sat to observe another Eastern Sierra phenomenon. Car after car came limping in to town from the pass, a victim of the deer migration; oozing coolant and getting ditched until morning. A note was made: Fear the Deer. Getting out early the next day bought a few hours without smoke and the provided the energy to go smoke-mask shopping. 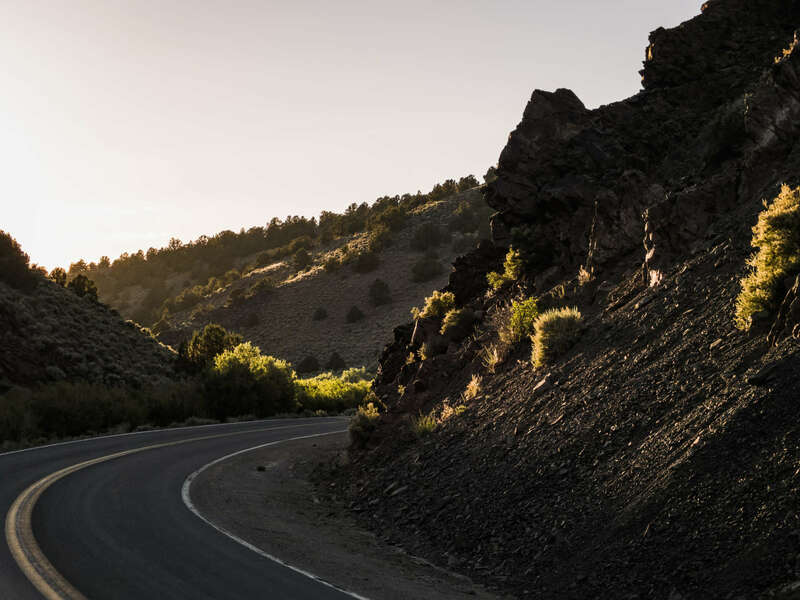 A figure-eight course around Old Mammoth and down to Hot Creek was set for the day. First stop was the Devil’s Postpile, which turned out the rangers had closed due to the air quality conditions. This was less of an issue to them than what I thought I was doing with “that car out here”. A lap around the lakes followed and by then vacationers had begun to slow the roads. North on Mammoth Scenic Loop was a great run, and the June Lake Loop followed. The map steered me wrong en route to Hot Creek, or rather, I got whipped for bringing the wrong tool to the wilderness. 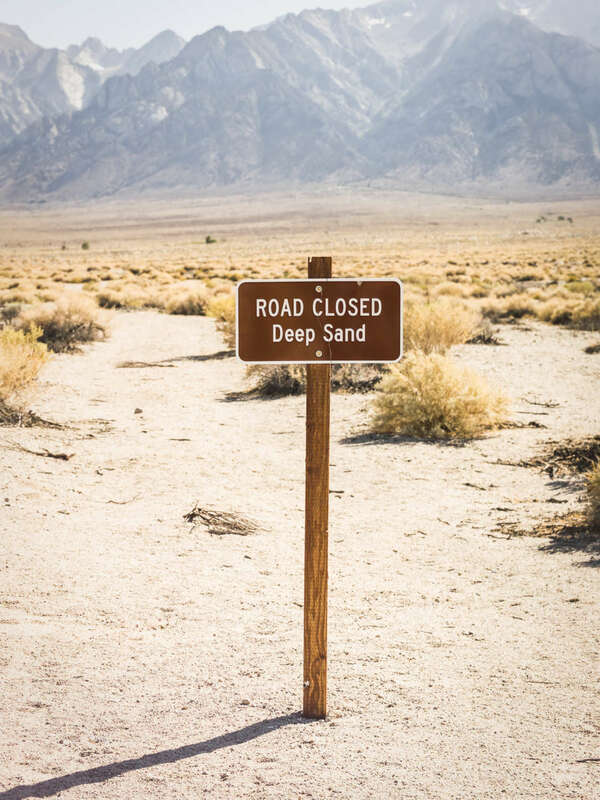 Owens River Road was a blast until abruptly turning to gravel, giving me plenty of time to consider buying a paper map that identified if a road was paved or not as I crawled along at 12 MPH getting passed by very amused ATV riders. The riders had a beer waiting for me at Hot Creek once I finally limped in to the geological site area. I traded them some water and we shot the breeze. 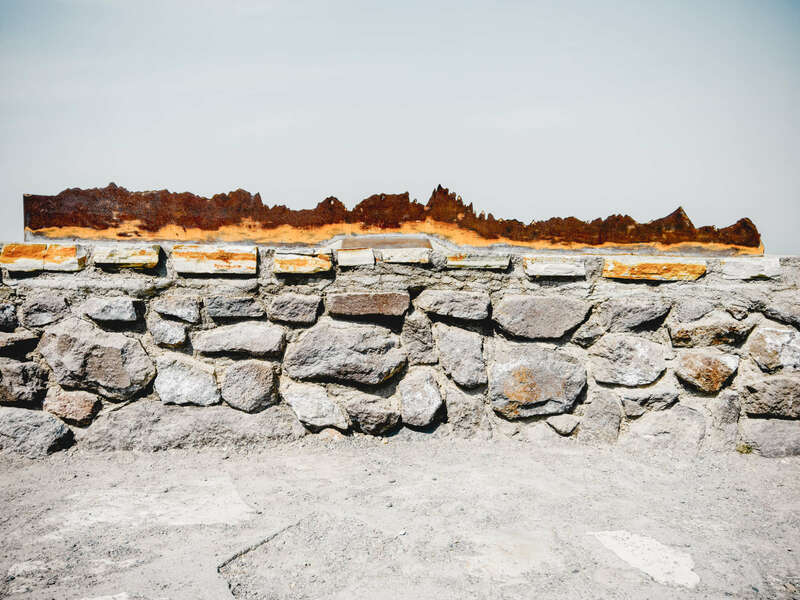 The site itself was incredible, though the hot springs are now closed due to wildly varying temperatures, the surface of the water still steamed in ambient heat over 100 degrees. Meanwhile, anglers fly-fish on catch & release just handful of yards upstream. Easy to spend a full day here. Finding the route with the shortest dirt stage back to 395, I headed back to Mono with another lap of June Lake thrown in for good measure, with time enough to make it to the correct shore for moonrise. As a bonus, a wrong turn out of the park after everybody had left put the car on dirt that it actually could do, and do very well. 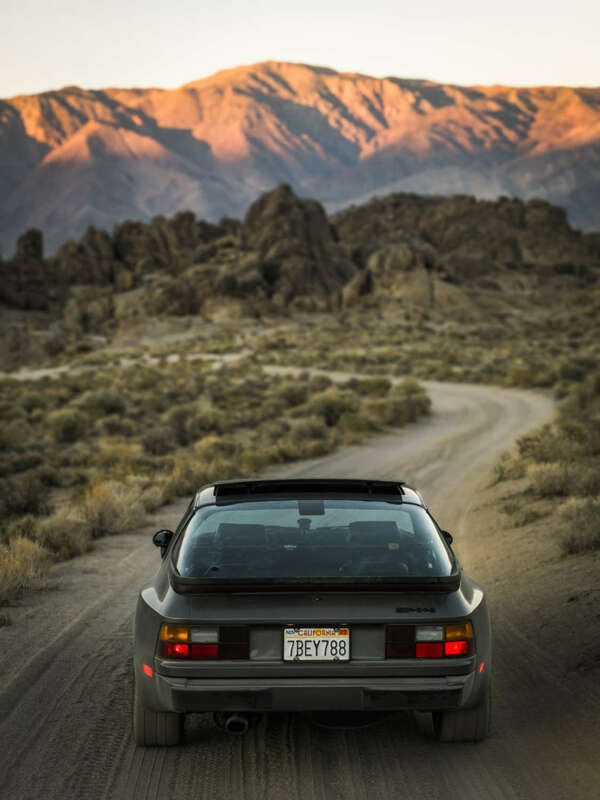 A little Catch-22 that it was after dark and have no concept of what magical qualities it possessed to make it right for the 944 but at least the ensuing dust cloud didn’t ruin anybody’s day. 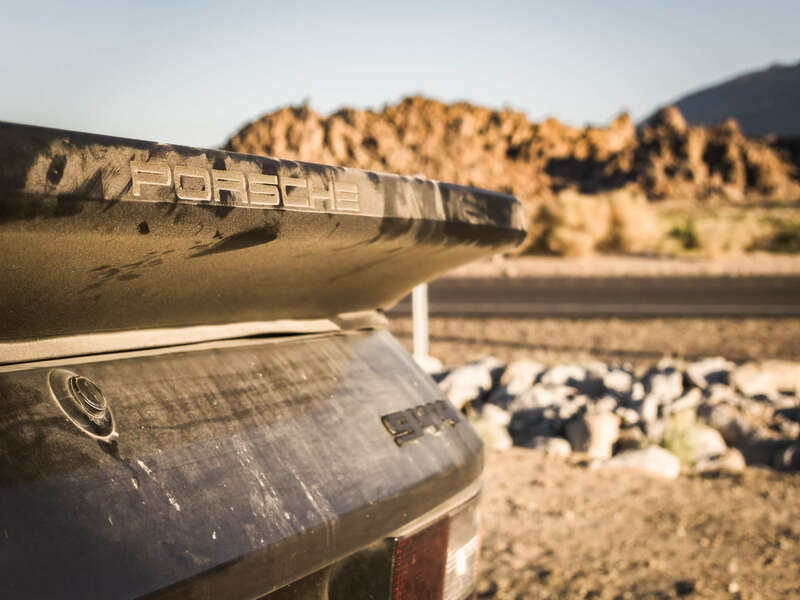 The next morning kicked off a big run south to Lone Pine with a gas/food stop in Bishop and the hope of making the run up to the Ancient Bristlecone Forest. Cresting at 11,000ft and getting there just as the hot part of the day was starting looked iffy… And it was. 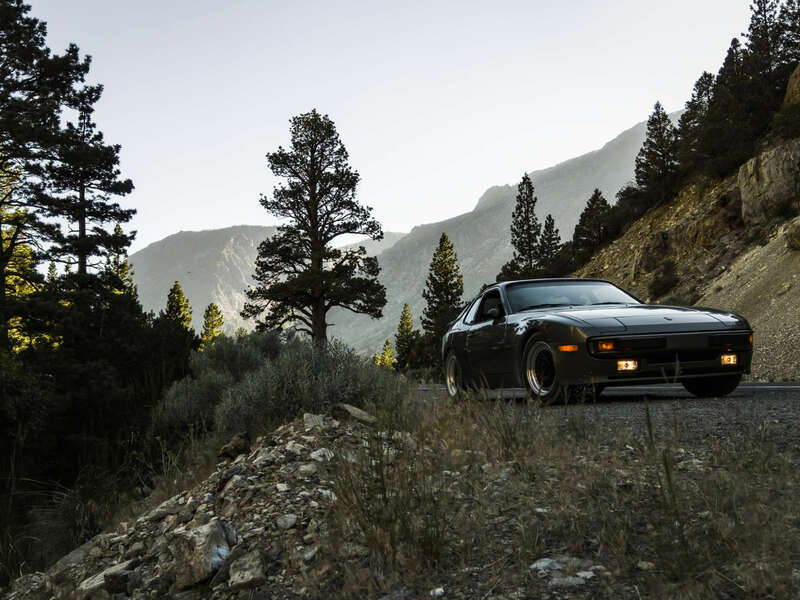 The grade of the climb taxed the underpowered, fully loaded car and had defeated the cooling system by 5,000ft. Thankfully it wasn’t terminal. Waiting half an hour for it to cool off as the day warmed up, I decided to go back to Bishop and get a fire extinguisher. Even if the car didn’t go up, I might spontaneously combust. Back on the road to Lone Pine, the heat was getting extreme. Desperate to cool off, I figured on a bird bath at a rest stop off the 395 but was lucky enough to discover a natural creek draining from the mountains. Having a moment to see what else was en route, there were a lot of one-way passes to high-altitude campsites that bike friends had recommended, but the failed climb to Bristlecone put those runs off for a cooler day. 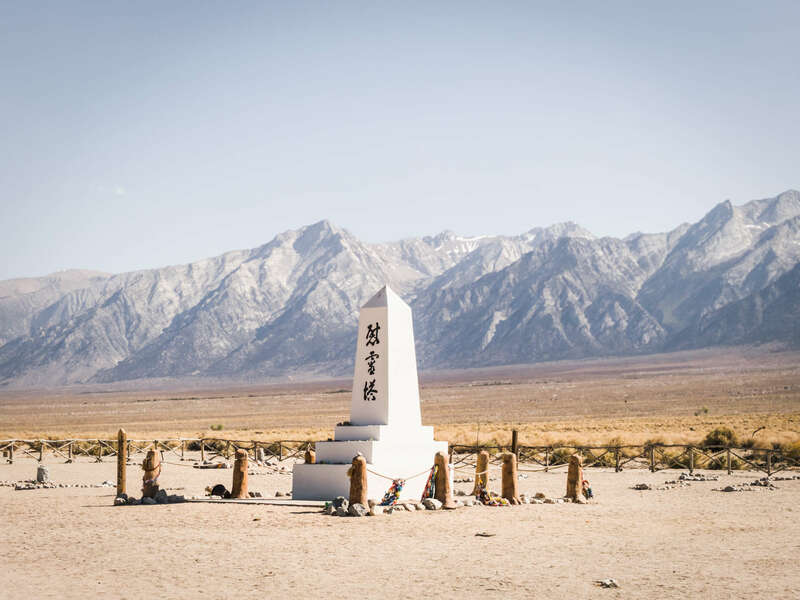 What is on the way, is Manzanar. This is one of the internment camps Japanese- American citizens were sent to during WWII. 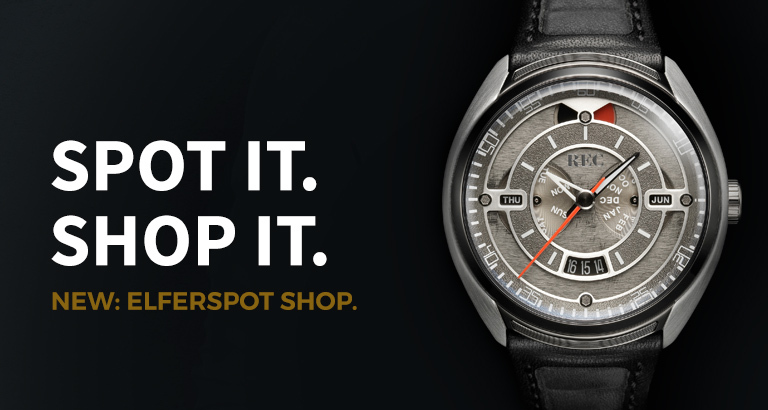 And seeing it in 110 degree heat should be mandatory. 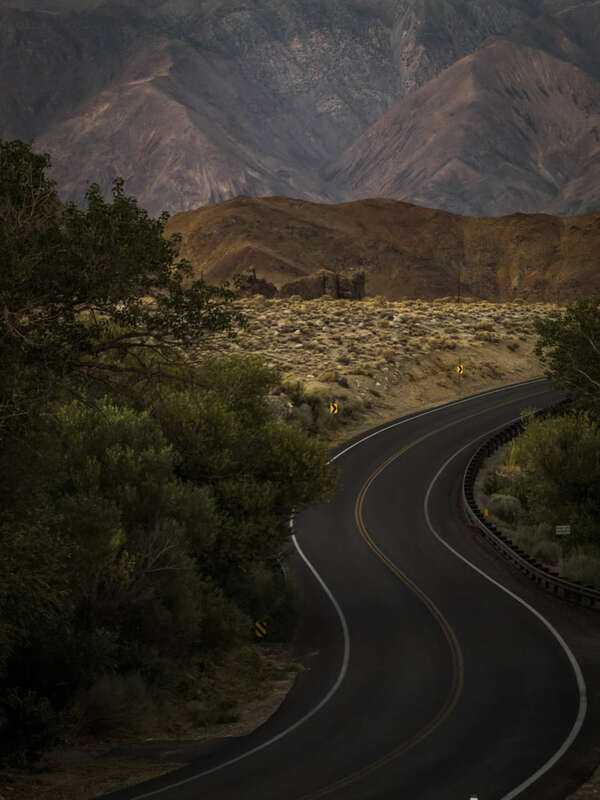 It’s a short run from Manzanar to Lone Pine with not a lot of time to reflect, so I caught last light with a little run to the Alabama Hills in order to preview the next day’s explorations. This turned out to be the place. 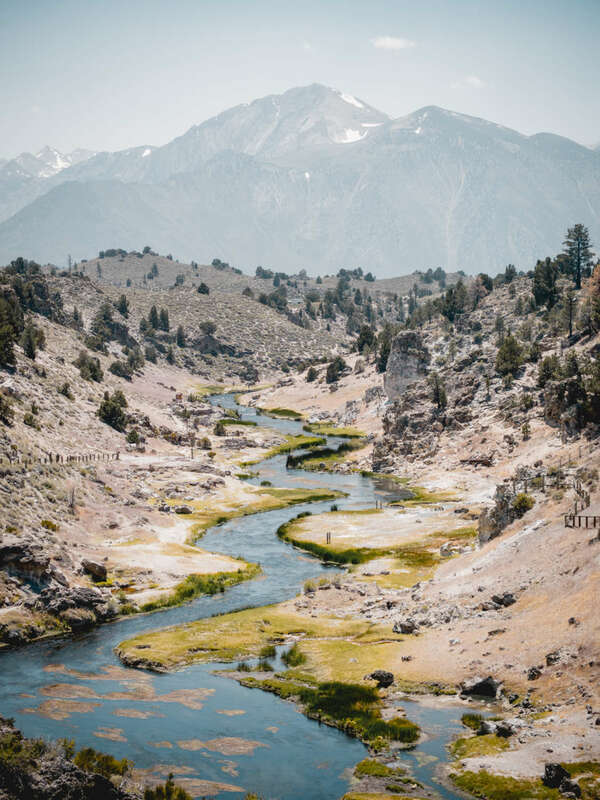 Used as a setting for movies since the 1930s and spurring the development of Lone Pine, it’s been the backdrop for Westerns and Sci-Fi films as well for all sorts of photographers. 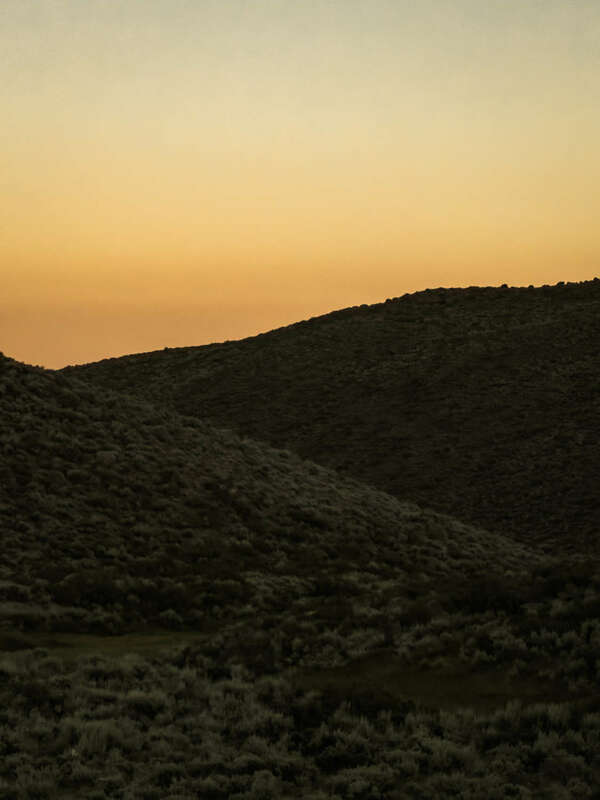 With decent dirt roads, bouldering and plenty of camping, it’s another place you could easily lose a day. Lone Pine being as far south as I wanted to go on 395, the next day aimed the car back at Bridgeport for one last overnight. I considered that the car had already done about 600 miles to get here and after having some time with the map; one last pass looked like a promising drive. The Ghost Town of Bodie has its own highway, and to preserve the town the last several miles of it are unpaved. This town also has visiting hours and it closes a couple hours before sunset this time of year. Being at 9,000 ft and 150 miles north it was significantly cooler temperature as well, especially in evening. It was shaping up to look like I’d have 10-plus miles of twisty mountain road 100% to myself for two hours, right at sunset. And that, thankfully, is exactly how it worked out. 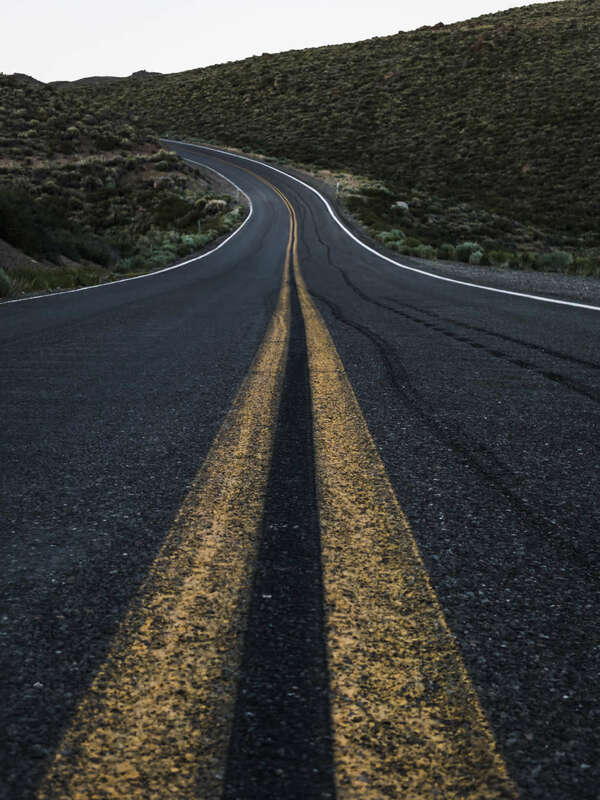 The road was in great shape, undulating, had sweeping wide turns, chicanes, drops into compression zones right before a climb… Cramped shale rock corridors opened in to huge meadows with light beaming right on apexes. It was absolutely perfect and I was perfectly alone with the car. Finding the end of the pavement at the top of the hill just after the sun slid behind the sierras offered time to stop and think. Apart from the oil pan dripping as the car cooled from the climb, there wasn’t a sound. There is still wilderness out there and this car’s reluctance to get deep in it was somewhat telling of its purpose. It’s the horse you’d ride for days, know intrinsically, trust and tend to; but it’s also the antithesis to the wilderness. We stopped riding horses everywhere for the sake of industry. For the sake of the wilderness, toys like these might need to stay in the chest & wait for a special occasion. I made one last lap once the color was gone from the sky. Figured I had found one of those special occasions. All images captured with the Light L16 Camera https://light.co/.